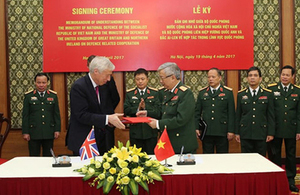 The UK and Vietnam signed a new Memorandum of Understanding on defence-related cooperation in Hanoi on 19 April 2017 to further promote bilateral cooperation, particularly in areas such as UN Peacekeeping Operations and international defence training. The signing took place after bilateral discussions between the Right Honourable Earl Howe, Deputy Leader of the House of Lords and Minister of State for Defence of the UK and Senior Lieutenant General Nguyen Chi Vinh, Deputy Minister of National Defence of Vietnam. Lord Howe’s visit to Vietnam was the first by a UK Defence Minister since 2012 and comes at a time of increasing Defence cooperation between the UK and Vietnam. As well as holding talks with Senior Lieutenant General Nguyen Chi Vinh, Lord Howe also held discussions with Major General Doan Hung Minh, Vice Chairman/Vice Director General of the General Department of Defence Industry and Vice Minister Bui Thanh Son, Vice Minister of Foreign Affairs. Lord Howe also paid his respects to Vietnam’s fallen soldiers by laying a wreath at the Hanoi War Memorial.